Grace King High School (Metairie, Louisiana) took pride in being "the best" high school in their district, but Assistant Principal Pamela Pritchard was still appalled by the fact that only 76% of freshmen were being promoted to the 10th grade. She introduced the Career Choices curriculum and the concept that "Failure is Not an Option" as a part of the school's 9th grade redesign efforts. The percentage of freshmen failing one or more classes dropped from 48.8% to 9% within one year. The 9th grade dropout rate fell: 2.9% (2005-06) to 0.1% (2008-09). The percentage of freshmen promoted to the 10th grade rose from 76% in 2005-06 to 91% within one year and to 93% within three, and suspension rates fell from 38.8% to 9.9% within one year and to 3.6% within three years. Rahway High School (Rahway, New Jersey) had an achievement problem and sought to remedy it with a Freshman Seminar/Financial Literacy course utilizing the Career Choices curriculum. Within one year of implementation, the freshman failure rate dropped from 50% (2010-11) to 35% (2011-12). Suspension rates for freshmen fell from 10% to 5%. Rahway High School was recognized by New Jersey Monthly magazine (August 2012) as one of the top 10 most improved high schools in New Jersey. Data related to this honor include: improved Advanced Placement, HSPA, SAT, and ACT scores; decreased failure rates; improved conduct; and an overall school setting built on an academic framework and supporting a college- going culture. "Expanding student development efforts beyond its campus to local high schools, Santa Barbara City College has created the largest dual enrollment program-which allows high school students to take community college courses-among California's 112 community colleges. SBCC is also helping high sch ool students, many of whom may not be financially or academically prepared, develop long-term education plans through college readiness and career counseling programs." Thanks to SBCC, development of a 10-year career and education plan is now a high school graduation requirement for all students in the Santa Barbara Unified School District. Participants in the Dual Enrollment Freshman Transition program have higher aspirations, better attendance, and fewer behavior problems than did students before implementation of DEFT. Poughkeepsie High School (Poughkeepsie, New York) had been cited by the state as a consistently underachieving school, but a Career Choices course instituted in 2009 is showing promise. The last cohort of students to graduate without Career Choices had a graduation rate of 59%. The first graduating cohort to have the Career Choices class had a graduation rate of 63% (2011) and the second cohort achieved a graduation rate of 83% (2012). 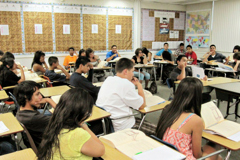 Indio High School (Indio, California) was struggling with abysmal test scores. A freshman transition course using Career Choices called Success 101 is continuing to transform the culture of this largely Hispanic school. The number of freshmen with three or more Fs decreased by nearly a half from 29% in 2009 to 16% in 2010. Freshmen were responsible for 49 of the school's 65-point API (Academic Performance Index) increase within that first year. 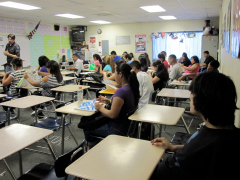 By the time the first class of freshmen became sophomores, 70 students had joined the CSF (California Scholarship Federation) versus 10 students from the previous class. The number of students failing a class decreased by 50%. The number of students who lost credit due to absences dropped by 35%. A rural district, Robeson County Public Schools (Lumberton, North Carolina) introduced a mandatory Freshman Transition program using Career Choices in all seven high schools to help curb a serious dropout problem. A 23% decrease in the number of dropouts was observed between 2010 and 2011. The rate at which freshmen were retained fell from 10.8% in 2006 to 1.5% in 2008. The percentage of students passing the High School Assessment Program (required for graduation in South Carolina) rose from 63.4% in 2006 to 78.6% in 2008. The percentage of students enrolled in CATE classes jumped from 44.8% in 2006 to 67.3% in 2008.